I've recently realized that I started writing for China.org.cn in November of last year, which means it's been one year. I've enjoyed every moment working and writing for this organization. It has been an interesting year for geopolitics as well. As a political scientist, it was great to see tectonic shifts in the world, right in front of our eyes. Some of these changes we might have predicted, some of them were so sudden that it changed the way one looks at the world. It also raises an interesting debate, whether political science has the ambition and scope of predicting patterns based on systemic changes or prescribing policies based on individual states. Unfortunately I am not omniscient, and I don't have the answer to those questions. However, given the context, I will attempt to write down the top geopolitical shifts of 2015 in this column. The rise of Russia has been a constant phenomenon since 2008. One can argue on the definition of how much Russia is actually rising, and how much Russia is on a solid foundation as a state, but there is no doubt that it is now an important player in geopolitics not to be underestimated or neglected anymore. Russia is now arguably acting as a revanchist power. It swiftly grabbed Crimea. It was unprecedented in world politics, and certainly in European politics, where one sovereign power essentially carved out a portion of another sovereign country and absorbed it. 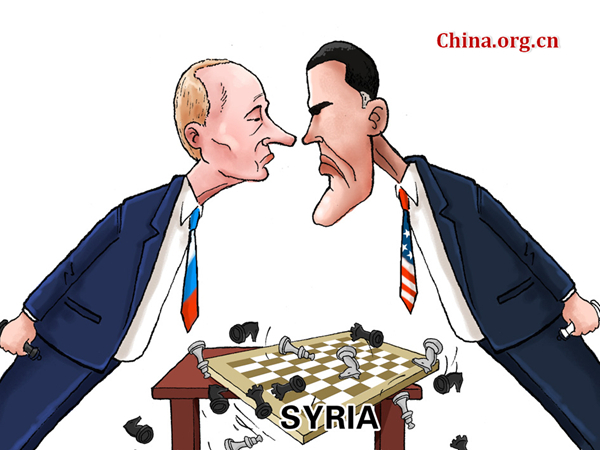 But this year saw Russia in its first foreign intervention outside its sphere of influence. Russian intervention in Syria was not anticipated by any major power, much less in any major analysis, and Russia continued to surprise everyone with its power projection capability and ability to influence actors outside its own sphere. U.S. President Barack Obama once said Russia is a second grade regional sphere. It seems the Russian state and definitely its ruling elites took that rather seriously, and are hell-bent on proving him wrong. This brings us to the second point, the wars in Middle East. The war which started with Libyan intervention is now a regional war of great powers, and is essentially a Middle Eastern version of the thirty years war in Europe where every great power vied for influence. All the major factors ranging from sectarianism, economics and religion are at play. In a development that underscores the complexity of a historically volatile region, the colonial borders drawn by the Sykes Picot agreements are as good as obsolete. The Kurds for the first time have a marked boundary, even though it is consistently shifting, and ISIS now rules a huge part of both Syria and Iraq, having its own state, justice system, and governing prowess. It also underscores the futility and the rampant destruction of all historically constructed institutions and can be regarded as a boiling pot, melting and destroying an entire region. One can only hope from its ashes a new range of national entities will arise, how long it will take no one can say. This then leads us to the third biggest change, the global human migration towards Europe. It is the first time since the Second World War that the world has seen such major migratory movements where millions of people are on the move towards unknown destinations and futures. It has resulted in untold suffering and misery, and has destabilized an entire region. The survival of the European Union is at stake, with far right racist and fascist parties on the rise and the hateful rhetoric now in the mainstream. Mainstream politicians are gob-smacked trying to counter the backlash as society shifts towards more insular and rightwing policies. Borders are being re-drawn; soldiers are out controlling movements as the free movement utopia comes to an end, and paranoia of Islamic jihadism reigns supreme. And this brings us to the final point, the diminishing capability of Europe and the United States to manage world affairs. In what is the most significant development of 2015, world affairs underscored how helpless, stoic and incapable world powers are in face of this immense policy paralysis. The U.S. is having its most divisive presidential campaign in living memory, with a complete indifferent and isolationist attitude to global affairs in general, and Europe is paralyzed and divided in dealing with a range of threats that can be solved with strong leadership and tenacity which is currently not being provided by any country. This will lead to further destabilization and suffering and conflict in the coming year, but that's the scope of another discussion. The orientation of the world's geopolitical power structures shifted radically in 2015 and will have drastic hangover effects in the years to come.